Adorable, trainable and energetic bull dog. Age is around 16 weeks, he is neutered and up to date on vaccines. He already knows basic commands: sit, stay, lay, crawl. He is crate trained and comfortable with all types of animals. 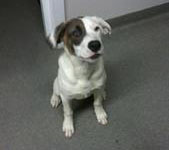 Please contact Breeze Animal Hospital at 850-233-7091 if you're interested in adopting Rocket. Adopted!! 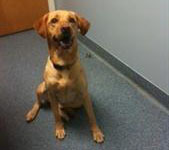 1 year female lab mix that is very attentive and knows basic commands, she has a lot of energy and needs a loving family. She is house broken, crate trained. She is adoptable thru the Bay County Humane Society and Hearts. Please contact Breeze Animal Hospital at 850-233-7091 if you're interested in adopting Giggles. Adopted!! !